Originally serialized in black & white comic books and graphic novels, the award-winning novel was presented complete and unabridged for the first time in this impressive 1300 page tome preserving the original black & white artwork. 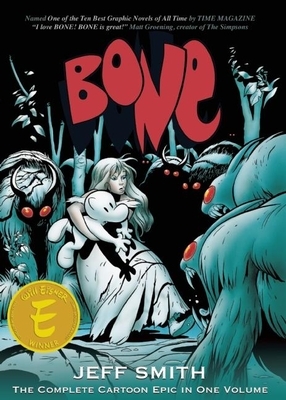 "Like Pogo, BONE has a whimsy best appreciated by adults, yet kids can enjoy it, too; and like Barks’ Donald Duck stories, BONE moves from brash humor to gripping adventure in a single panel." "Jeff Smith can pace a joke better than almost anyone in comics; his dialogue is delightfulso are all his people, not to mention his animals, his villains, and even his bugs."